Throughout this work on the Landscape of Trust, I’ve avoided the temptation of talking about opposites: I prefer to think that we either have trust or an absence of it. With that in mind, and with the caveat that this is very much an exploratory phase of thinking, I think we can view mistrust as something that exists in parallel. Mistrust is a force in itself: not simply the absence of trust, but rather something which may arise on the other side. The reason I’m choosing to view these in parallel rather than simply as opposite ends of the spectrum is because, in the context of culture, both can be simultaneously true. As we burrow deeper into the Landscape of Trust, we see that there is variation in the level of trust that people feel dependent upon the relationship they have with them, but also their location within the hierarchy of the organisation. Trust is also invested in inanimate objects, such as technology. With that in mind, it’s possible to experience both trust and mistrust at the same time with different people, technologies, or teams within the organisation. I tried to explore this imperfectly earlier in this work, but now returning to it as the landscape becomes clearer. For this model, I’ve been inspired by a tool called the semiotic Square, although I’m quite prepared to admit that my application of it may be imperfect, hence calling it inspiration by rather than simply application of the tool. I’m using this to help draw the link between individual behaviour and group culture, or rather cultures, as individuals may belong to multiple concurrent sub cultures throughout an organisation. 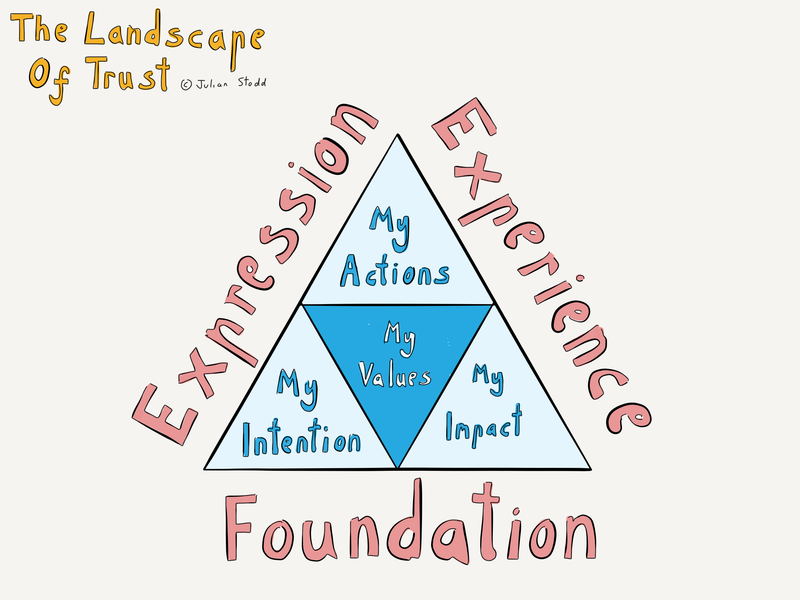 The model shows two primary axes: one for trust, and one for mistrust. Top left we see ‘trust’, with an axis that runs down to ‘no trust’. Remember, no trust is not the opposite of trust, it’s an absence of it. Top right we see ‘mistrust’, which runs on an axis down to the bottom left for ‘no mistrust’. Again, if we don’t actively mistrust, we cannot assume we have trust. We simply don’t have active mistrust. With these four elements in place, we can look at the intersection between the two, which allows us to chart out four spaces. Firstly, a space of trust and no mistrust, which we can see on the left and is labelled ‘invested’. Second, a space of trust and mistrust, existing simultaneously, which is labelled ‘functional’. Thirdly, at the bottom, we have no mistrust and no trust, which is labelled as ‘potential’. Fourthly, on the right, we have a space of mistrust and no trust, which is where the culture is ‘broken’. 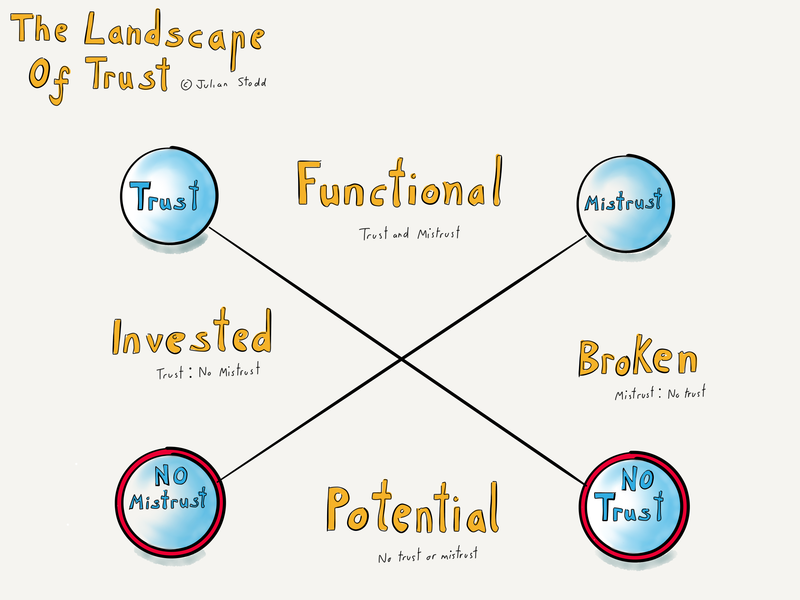 If you’ve been following this work, you’ll notice that I previously talked about invested trust and functional trust in the work around the taxonomy: this charts how we can move from no trust, through functional, to invested, and finally onto blind trust. The taxonomy is a way of looking at how we go from no trust to too much trust. This square, by contrast, is away of looking at how trust correlates with mistrust, but I recognise that this will all need tidying up later. I think it’s okay with early stage research to keep prodding the boundaries. Essentially, this square represents how the culture emerges as an artefact of all the individual relationships within it. The work I started a few days ago, looking at a triangle of foundation, expression, and experience, was aimed at individuals exploring how their personal landscape of trust relates to the actions that they take. I may not be explaining this perfectly yet, but I think that us this body of work unfolds, there will be three main components. The first will be the landscape of trust which puts parameters around the highly subjective notion and uses a diagnostic to plot a heat map of where an organisation or individual sits against the baseline. The second part will be a framework for individuals to explore how their personal view of trust impacts on their actions, their reputation, and the wider organisation. This third part, which looks at cultural impact, will correlate to the landscape diagnostic, and perhaps develop into a journey for targeting interventions to make incremental gains in organisational trust. This entry was posted in Trust and tagged Behaviour, Change, Culture, HR, Landscape of Trust, Leadership, Mistrust, Semiotic Square, Semiotics, Trust. Bookmark the permalink.